The police were already assembling alongside activists and community members, having caught wind of our plans to do direct action in the streets of downtown LA against the Los Angeles County Metropolitan Transportation Authority (MTA). The Bus Riders Union (BRU) drum core was prepping marchers with energetic chants demanding that MTA respect our communities “La tierra no se vende! 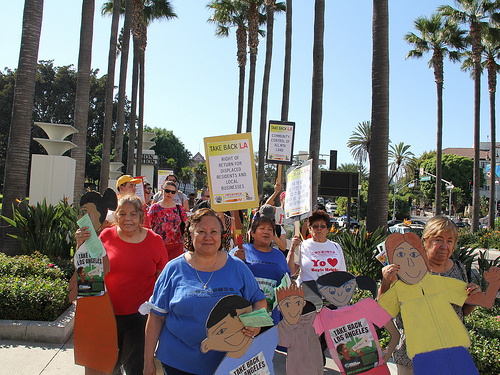 Se ama y se defiende!” Buses full of Right to the City Alliance (RTTC) activists from all corners of the nation pulled up alongside Father Serra Park, unloading a mass of allies who deal with similar struggles in their neighborhoods and cities. Our allies from Right to the City, representing 43 social justice organizations from 10 states, and 13 different US cities joined East LA Community Corporation (ELACC), BRU, Union de Vecinos, Legacy LA, Proyecto Pastoral, Innercity Struggle, Koreatown Immigrant Workers Alliance (KIWA), Strategic Actions for a Just Economy (SAJE), Esperanza Community Housing Corporation, Southeast Asian Community Alliance (SEACA), and Shared Spaces as we worked to TAKE BACK LA! Hundreds of us came together to throw down on the MTA. As negotiations with LAPD and the Sheriffs ensued over what our route would be, we commenced the march with the intent of flooding Union Station, drums pounding, and chants filling the stuffy, hot summer air. We were angry and tired of being marginalized by the agencies who keep moving ahead without us, thinking they understand the needs of our communities better than we do. For too long, the MTA told us what they thought was good for us. For too long, the MTA had put enormous energy into talking to its friends in our community, and not the residents who are directly impacted by its corporate-driven development model. In Boyle Heights, eight vacant lots represented seven years of nothingness. For seven years, these lots lay vacant—a stark reminder of the over 200 families that were displaced by the construction of the East Side Gold Line Extension, the cutting of vital bus service that low income residents rely on to survive, and the robbery of critical services and goods. MTA states they have replaced what was lost—how can that be when these sites are still vacant? 1,222 units of affordable housing had been replaced throughout the county, they say. But what about what was demolished in Boyle Heights? 52 new units are on their way, they say. All this in the name of Smart Growth - a progressive utopian concept of urban development aimed at reducing greenhouse gas emissions by getting people out of their Volvo’s and into public transportation. A concept on paper, no one could oppose. But in practice, it has displaced many low income families of color throughout the Nation. This is what Smart Growth looks like in working-class communities of color with a rich history of being shafted by the Man. So there we were, taking our fight to the streets. Impacted residents telling their powerful stories, complete with teatro, and beautiful art visuals depicting a truly healthy community. A truly healthy Boyle Heights where all residents could thrive, and where all residents can continue to raise future generations without fear of being pushed out somewhere else to make way for gentrification. We marched through the MTA headquarters and onto César Chávez Bridge, making a symbolic statement in the name of the legendary workingclass fighter. We marched through OUR neighborhood. At the end, a beautiful and wonderfully positive community party, our own pachanga at Mariachi plaza, complete with street food vendors and live music from local musicians and Chicano artists. One direct action won’t change the system, but it edges us ever-closer. Our time is now, we have to take back LA. But more importantly, we have to fight for our Boyle Heights.